Beijing’s preparations for the 2022 Winter Olympics have set many examples of how to make future Games more efficient and sustainable, the International Olympic Committee said this week. They include already putting plans for its legacy into effect. 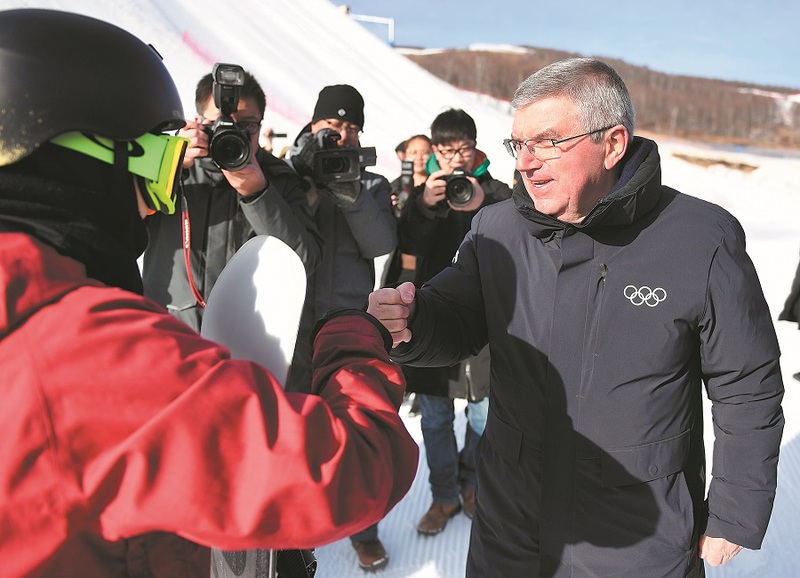 Thomas Bach, president of the International Olympic Committee, gave a thumbs-up on Tuesday to China’s efforts to integrate preparations for the 2022 Games into regional development plans. He visited the proposed Games’ venue at the Genting Resort in Zhangjiakou’s Chongli district in Hebei province against a backdrop of skiers gliding downhill one after another. The resort has become busier since Beijing and co-host Zhangjiakou won the bid in 2015. It serves as a model of China’s vision to turn the Olympics into a catalyst for winter sports promotion, tourism and economic growth in the region, which fits IOC reform proposals for Olympic events. “We can see the great progress, but what is even more important is that we can see that the plan of making 300 million Chinese people familiar with winter sports already works,” said Bach, who is in China attending the IOC’s Beijing 2022 Project Review. The upcoming Beijing Games will use 24 competition and noncompetition venues located in three clusters — downtown Beijing, its northwest Yanqing district and Zhangjiakou’s Chongli district. The IOC group led by Bach, in Chongli on its first stop on Tuesday, inspected the renovation of facilities and construction of new ones. Eight venues are being prepared for six disciplines including freestyle skiing, snowboarding, and biathlon. The Genting Resort, opened in 2012, logged 300,000 visitors in the 2017-18 winter season, a steady increase boosted by its prospects to host part of the freestyle skiing and snowboarding events during the Games at refurbished and new facilities. Beijing’s downtown, connected to Zhangjiakou by a high-speed railway scheduled to open later this year, demonstrates the use of an Olympics legacy with eight out of 13 venues transformed from the 2008 Summer Olympics’ facilities. The Shougang Industrial Park on the capital’s west side, a former steel mill closed before 2008 to reduce pollution, has impressed the IOC the most after being repurposed into the headquarters of the Beijing 2022 organizing committee and a hub for multiple winter sports venues. IOC Vice-President Juan Antonio Samaranch, who has visited the park frequently since 2016, praised the change. “This is an extraordinary example of how the Olympics can transform the city for the better, not only after the Games but in your case before it opens,” Samaranch said during his stay for the project review. Samaranch, also chairman of the IOC’s Coordination Commission for Beijing 2022 and the son of the late IOC president of the same name, attended a ceremony on Wednesday to launch the Green Power Supply program for Beijing 2022 that is facilitated by the State Grid Corp. The Beijing 2022 Olympics will become the first Games in history to power all its venues with green and renewable energies produced from clean sources such as solar, wind and geothermal, according to the IOC. With all the efforts on facility reuse, energy saving and promotion of winter sports in place, the IOC expects Beijing 2022 to set a benchmark for future Olympics. “We have to make sure that every yuan spent in this organization is worthwhile and reasonable, and it leaves a legacy,” he said. The IOC’s project review continues on Thursday with Beijing organizers discussing key aspects of the preparatory work, including venue readiness, marketing, and communication with officials from the IOC, the International Paralympic Committee and international winter sports federations. “We see all the schedules are respected so far. It’s the Chinese way. We are really very sure about the completion of the work at the right time and also the success of the Games,” Bach said.